We're heading into the second half of the summer and that means county fair season. The Saratoga County Fair in Ballston Spa started Tuesday. And as August arrives, there will be a county fair somewhere around the region pretty much each week through Labor Day. County fairs are remarkably long-recurring events -- some in this area are more than 170 years old, and one of them is approaching two centuries. Here's a rundown of county fairs around the region, with dates, admission info, and whatnot. Where: Saratoga County Fairgrounds in Ballston Spa. How much: $12. Season ticket is $30. Shorter than 52 inches is free. Active military free with active duty card. Unlimited ride wristband is $20. How much: Wednesday and Thursday $15 / Friday-Sunday $17. Free for children 2 and under. Season pass is $55 (must buy before fair starts). Veterans and military admitted free August 11. Admission includes rides, grandstand shows, and parking. How much: Tuesday and Wednesday $17 / Thursday-Sunday $19. Kids under 36-inches tall are free -- but they're not allowed to ride the Midway rides. Active military, veterans, and seniors get free admission Wednesday until 6 pm. You can save a few bucks by buying tickets ahead online, where they're $15. The tickets include "admission, Hollywood Circus, live music, shows, exhibits, museums, parking and unlimited rides." The Altamont Fair is the county fair for Albany, Schenectady, and Greene counties. This will be its 126th year. It was first hosted in the city of Albany in 1819 in Washington Park and at the State Capitol. How much: Adults $12. All-week pass is $36. Kids 13 and under are free. Free admission for all active military service members with military ID. Admission does not include carnival rides. During the fair, ride tickets are 20 for $20. But if you buy online before August 19, you can get 20 ride tickets for $10. Rides take 2 to 5 tickets -- 1 fewer per ride on Children's Day. Also: Tuesday, Friday, and Sunday are hand-stand days -- you can ride all the rides from noon to closing for $25. The Washington County Fair touts itself as "New York's #1 Agricultural County Fair." How much: Adults $10 -- Sunday is $15. Active military with ID or uniform free. Kids 12 and under free. There are also $8 advance tickets available at the fair admin office until the Tuesday night before the fair. You can also get them at a handful of retail locations in August. This is the 178th Columbia County Fair. How much: Adults $12 (opening day is $1). Season pass is $40. Kids 13 and under are free. Advance admission and ride tickets are available at Price Chopper August 5-28 -- admission is $10 (Thursday-Monday) and unlimited rides tickets are $19 (good for any one day, does not include admission). The Schaghticoke Fair is the county fair for Rensselaer County. This is the 199th year for the Schaghticoke Fair -- it's said to be the 3rd oldest fair of its type in New York State. How much: $10 adults. Seniors are $5 on Wednesday and Friday. Kids 6-11 years old $2, kids under 6 are free. Kids under the age of 14 get in free on on Wednesday and Friday. This is the 177th year for the Fonda Fair -- it was first held in 1841. It's the agricultural fair for Fulton and Montgomery counties. How much: Adults $15 ($10 on Tuesday) / $12 ahead. Kids 11 and under are free. Seniors (65+) and military with ID are $8. There's also $7 admission after 5 pm on Thursday. Admission does not include rides. Ride tickets are 4 for $5 and 22 for $20. You can get a ride-all-day wristband for Wednesday and Thursday for $25. If you buy ride tickets ahead they're 10 for $20. The Dutchess County Fair is a bit outside the Capital Region -- it's a little more than a hour's drive south. 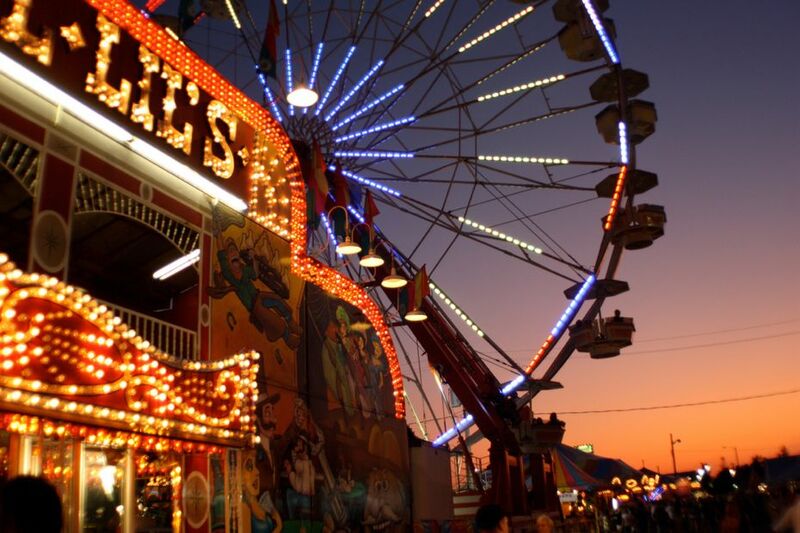 But we hear it's quite the county fair, and worth the trip if you're a fan of county fairs. How much: Admission is $10 for adults, except for August 23 and 30 when it's $3, and opening day and Labor Day when it's $1. Seniors get free admission August 27-28. Students 18 and under are in free August 31. Kids 12 and under are free every day. There are also advance tickets available for $6, either online or at retail locations such as Price Chopper or Wegmans. Admission does not include midway rides. Unlimited-ride wristbands are $25 weekday / $30 weekend -- you can save $5 on each by buying ahead. August 27 is 10 rides for $10 day. And Labor Day is $1 ride day. The state fair also includes some high-profile musical acts. This year's lineup includes Blondie, the Tedeschi Trucks Band, Ludacris Counting Crows, Smokey Robinson, The Temptations, Lil Yachty, and Niall Horan. The show are free with fair admission. By the way: The official name of the state fair is the "The Great New York State Fair."